In the past, if you wanted to get a qualification, or even simply learn something new, you would sign up for a course at a bricks-and-mortar institution, pay any relevant fees, and then physically attend class. That was until the online learning revolution started. Last year, the e-learning market was worth an enormous $166.5 billion. It’s been estimated that this will grow to $255 billion by 2017. Its growing financial value is matched only by the swelling numbers of students choosing to follow an online course. 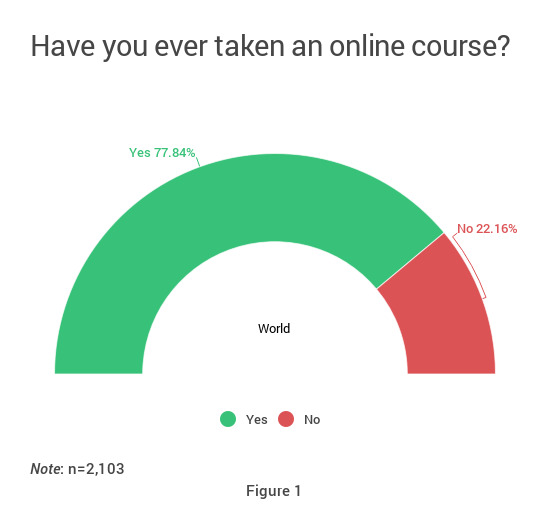 In the latest Global Shapers Survey of 25,000 young people from across the world, 77.84% of respondents reported having taken online courses in the past. So is online learning the future of education? Let’s start first by looking at what exactly it is. Online education takes two major forms. The first: for-credit courses where students enrolled in tertiary education take online classes offered by home or other higher education learning institutions for credit. Some well-known cases include the MIT OpenCourseWare and the Harvard Online learning. The second form of online education consists of professional training and certification preparation. Such online learning is usually targeted at professionals or students seeking training or preparing for certification exams. Popular courses include training in foreign languages, accounting and nursing. 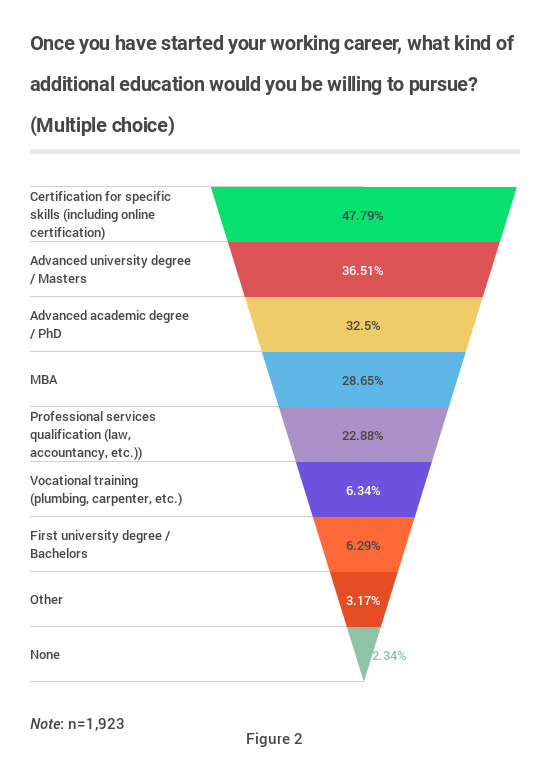 In the Global Shapers Survey, close to half (47.79%) of respondents said they would be willing to pursue certification for certain skills, including online certification, once they have started their working careers. This again speaks to the large potential and market for online education. The growth of online education has not been without challenges. Since its early inception in the 1960s, online education has been constantly criticized for its apparent lack of quality control, particularly the scarcity of high-quality teachers. It’s also been said that online learning deprives students of some of the benefits of being in a classroom, such as teacher-student interaction, as well as other things such as a reliable internet connection and electricity supply. Regardless of these concerns, online education has made great strides in recent years. For starters, more and more institutions of higher learning have introduced or reinforced their online education platforms, the main considerations being cost reduction for students and recruitment expansion in face of rising competition. As a result, online education has become an increasingly important part of tertiary education, with colleges and universities using world-famous faculty members and professional support teams to promote online courses. To tackle the question of teaching quality, a number of providers have turned to user rating and internal evaluation. Star teacher, for instance, has become a popular teacher evaluation mechanism in China and South Korea, two of the largest e-learning markets. 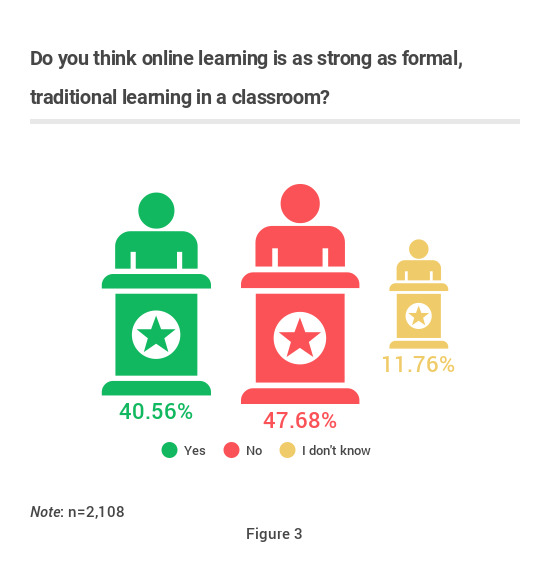 Overall, such progress seems to have eased the doubt about the quality of teaching, and 40.56% of respondents in the Global Shapers Survey said online education is as strong as traditional learning in a classroom, with another 11.76% saying they didn’t know. The maturity of education technology has also enabled online education to become more manageable and accessible than ever before. All a prospective student needs is a computer, an internet connection and some basic IT skills. As for the loss of traditional classroom features, online education has been making up for this through its flexibility and low cost. Students have access to their “classroom” recordings whenever they want, allowing them to go over ideas and review lessons at their convenience. Some have also pointed out that far from being an inferior learning experience, the one-on-one lessons that are often part of online education have taken teacher-student interaction to a new level, where one student is getting all the attention and the interaction, and training can be so unique and valuable. Furthermore, some argue that online education has significantly helped make education more accessible, thus achieving the aim of “education for all”, a theme that has become a global mandate since the 1990s. While a large number of countries have made significant progress in their provision of basic education to all citizens, there are still too many people – often living in remote areas – who can’t access education. But with an increasing number of “netizens” in rural areas in many developing countries, online education could be used to reach the last group of citizens without proper access to education and hence fulfill Sustainable Development Goal 4 concerning quality education. Undoubtedly, with the even wider spread of technology and deepening of the global mandate of education for all, online education’s potential to become complementary – or in some cases alternatives – to traditional education cannot be overlooked. Instead of worrying whether or not online education can ever be as good as more traditional formats, perhaps we should instead focus on how we can use it to deliver quality education for people all over the world, particularly the poor and underserved. This won’t be an easy task – online education is in dire need of regulation. Outstanding issues include the question of accreditation and quality control. This gets even more complicated when you consider the international dimensions. For years, cross-border credit or degree accreditation has been a major issue for various education systems. The flexibility of online learning will only make that harder. The obstacles are real but not insurmountable. And the opportunity to make good on the promise of education for all is too big to miss.